So You Are Thinking Of Eating Raw, Living Food? There are so many options when trying to choose a diet that works for you and your body. From vegan to Atkins it can be a cumbersome task to research. One of those choices is making the decision to eat raw, living foods. In all actuality it is one of the oldest forms of dietary consumption. If you think back to our origins, there were no such things as processed foods. So it makes sense that consumption of raw, living foods would work well in our diet today. Plus it does eliminate the nasty intake of processed, preserved and over cooked meals. In this post we will talk about one such food, and that is sprouts. There are many different sprouts out there, it is simply the shoot of a plant eg, Brussels sprouts, legume sprouts, etc. What is being focused on here is facts about the nutritional value associated with sprouts, and why they are very important to incorporate into a raw, living food diet. Before we get into the nutritional statistics contained in sprouts, it should be noted that raw foods in general pack several benefits. When you cook food to beyond 118 degrees, it begins to kill off nutrients. Another perk of eating raw, living food is that you are getting the maximum enzyme intake contained inside the food you are consuming. That helps your body naturally gain energy and keep you feeling fresh and awake. Remember that there a lot of different kinds of sprouts, but as a whole group they share some common nutritional traits. All raw, living sprouts are very high in Proteins, with alfalfa being the highest Protein content. This means that you can consume a lot of sprouts and get a significant more amount of Protein than even the lightest of the meat group, fish. This ensures you get energized, but not that sluggish weighed down feeling we get when we eat too much. Almost all sprouts have Vitamin A, B, and C. Most contain the minerals Magnesium, Iron and Calcium. 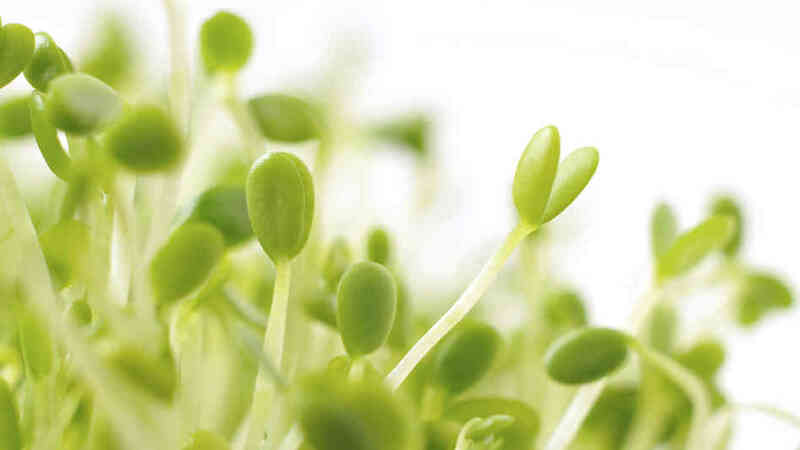 Some also have unique properties like Buckwheat sprouts containing Lecithin and Pea sprouts containing All Essential Amino Acids. With that being said, it is easy to see that based on those facts, raw, living sprouts are 10-30 times healthier than the best vegetables you could get market fresh. Another great reason to consider them for your raw foods diet is because they are very easy to grow. You can grow them from beans and from the comfort of inside your kitchen. All you need is a jar, some seeds, water and in some cases a screen. There are plenty of articles out there explaining the process in detail, but you can see that the process is very easy and low stress to maintain. So there you have it. That explains the health benefits of sprouts in comparison to cooked food and vegetables and now you also know how easily they can be grown inside your home with very little investment. If you have not considered introducing raw, living sprouts into your diet, maybe now is the time to consider it as they are healthy and delicious!